A stock photo of Baku railway station. Credit: Andrii Zhezhera/Shutterstock. A new rail corridor linking Azerbaijan and Turkey via Georgia is set to launch in October, establishing a new freight and passenger link between Europe and China. Beginning in Baku, the capital of Azerbaijan, trains will stop at the Georgian capital city of Tbilisi, pass through gauge-changing facilities in Akhalkalaki and terminate in north-east Turkey. 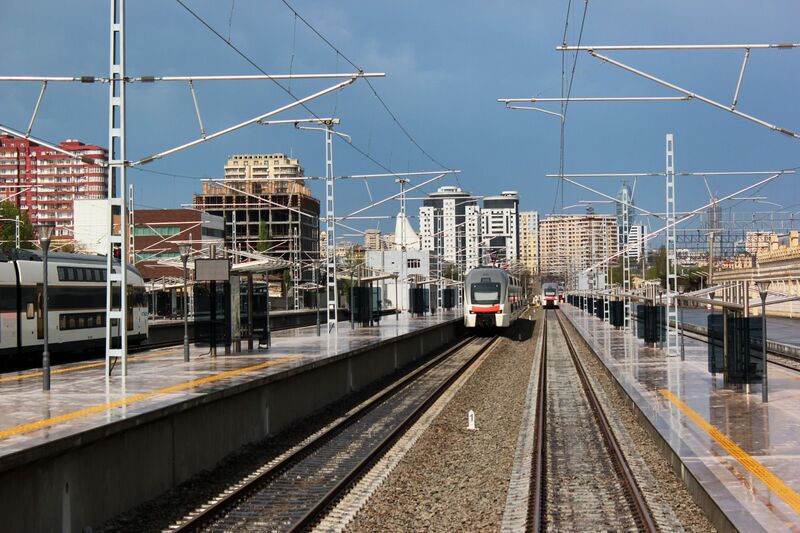 The Baku–Tbilisi–Kars railway (BTK) promises to provide an economic boost to the region, increase connectivity between Europe and Asia and encourage more freight to go by rail. 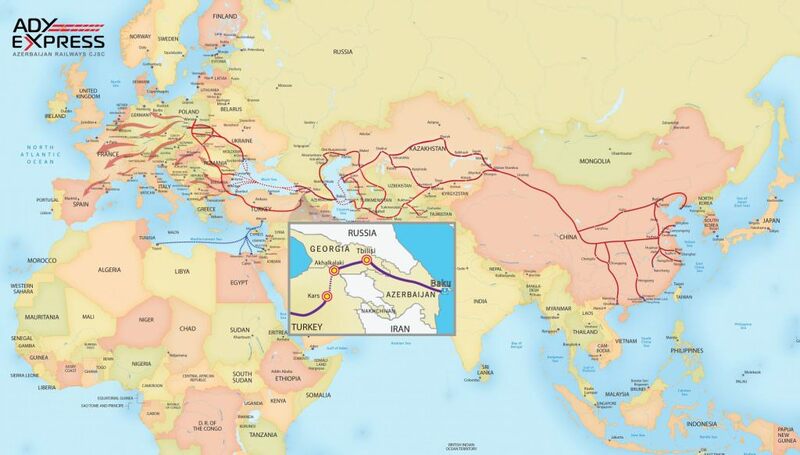 It includes 722.7km of existing track (503km in Azerbaijan, 218.2km in Georgia and 1.5km in Turkey) and 102.3km of new track (26.3km in Georgia and 76km in Turkey) to plug gaps in the network. Reconstruction work in Georgia has been undertaken in three stages: Marabda-Tetritskaro; Tetritskaro-Tsalka; and Tsalka-Akhalkalaki, all of which has been financed by Azerbaijani loans totalling $775 million. Of the Azerbaijan stretch, work has included: changing the power supply from alternating to direct current, improving signalling, communication and auto-blocking systems and the creation of a centralised control system. At the same time, construction of a 4,450m tunnel on the Turkish-Georgian border has also been completed since the project began in 2007. China is Europe’s second biggest trading partner behind the United States while Europe is China’s biggest trading partner. The EU imported €344.6 billion of goods from China in 2016 and exported €170.1 billion, a chunk of which could now pass through BTK with even future turnover growth between the two economic powers. Illustrating how the BTK railway will connect Europe with China. Credit: Azerbaijan Railways. A freight subsidiary of state-owned operator Azerbaijan Railways, ADY Express, also points to the huge opportunities to carry cargo from Afghanistan – where geologists discovered $1 trillion of mineral reserves a few years back – on BTK. Passenger services will also be launched on the route, with three million passengers a year expected to use the line by 2034. Azerbaijan Railways has initially ordered three 10-car sleeper trains with gauge-adjustable wheelsets from Stadler for passenger operations – a first contract for the Swiss rolling stock manufacturer in the country – which also includes an option for an additional 70 cars. As the region prepares for the expected launch of the line, should BTK reach its full potential, it could become the preferred option for freight between Europe and Asia as a quicker option than sea and a cheaper one than air. It could increase the importance of railways in the Caucasus, boost the economies of Azerbaijan, Georgia and Turkey and strengthen ties between Europe and Asia.